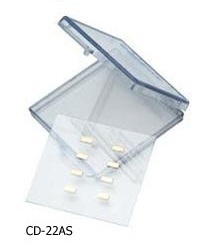 Gel-Box AD Series Carriers owe their unique device-holding capabilities to a proprietary GEL coating applied directly to the bottom of a hinged box. Devices are held once contact is made with the GEL surface and will stay in place, even if the carrier is tilted or jarred. The carriers are designed for manual off-loading with tweezers or by hand. Gel-Pak AD Carriers are ideal for handling devices where no direct contact with the top of the device is important. When immobilized on the GEL surface, devices with exposed wire bonds as well as sensitive surface components can be safely handled and shipped. If you prefer a version where the Gel coated surface can be removed from the hinged box, we have Gel-Tray® (BD Series) and Gel-Slide (CD Series) products. Gel-Tray (BD Series) consists of a 2″ x 2″ pocket-less plastic tray stored inside a plastic hinged box. The proprietary Gel coating is applied directly to the surface of the plastic tray. Similar to Gel-Boxes, the Gel-Tray products are normally intended for manual applications in which devices are loaded using a vacuum pen, tweezers or fingers and unloaded using tweezers or fingers. The Gel coated plastic tray can be easily removed from the hinged box. This offers a convenient solution for customers who prefer to place the Gel carrier onto a holding fixture or raised pedestal during device loading or unloading and makes possible the loading of the Gel-Tray using semi-auto or fully automated Pick & Place equipment. 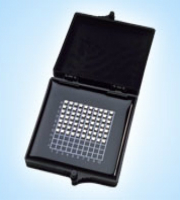 Gel-Slide (CD Series) consists of a 2″ x 2″ pocket-less glass slide stored in a plastic hinged box. Gel-Pak’s proprietary Gel coating is applied directly to the surface of the glass slide. Same as Gel-Boxes and Gel-Trays, it is intended for manual applications in which devices are loaded and unloaded using tweezers or by fingers. The Gel-Slide is similar to the Gel-Tray, but with one major exception; the Gel-Slide can be used in applications up to 220°C for extended periods of time. The Gel-Slide is designed for higher temperature applications such as bonding and reflow where a plastic tray will not work. 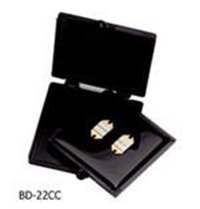 The CD glass slides are also ideal for backside inspection due to their optical clarity.